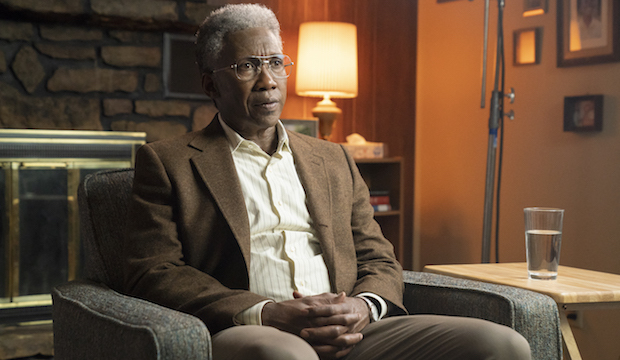 The first season of True Detective was one on a string of culture-shaking shows that deservedly attracted the cliché of ‘cinematic television’. As well as sticking to one story per season, the casting of movie stars like Matthew McConaughey and Woody Harrelson (still credited as executive producers) blurred the divide between TV and cinema. Then season 2 happened and its appeal plummeted. But with season 3, writer/creator Nic Pizzolatto clearly tries to make amends by returning to the chilly, Southern atmosphere of small towns and tight-knit communities. And although the detective-relationship and existential anguish looks pale in comparison to Rust and Martin in season one, this new case – spread out over 35 years – is an alluring return to the darkness. In Arkansas, Detective Wayne Hays (Mahershala Ali) is an old man in 2015, caught between colliding memories as he harps back to the unsolved Purcell case in 1980 and the release of his wife’s (Carmen Ejogo) book about it in 1990. Involving two missing children in the town of West Finger, Wayne tries to put the scrambled pieces in his mind back together in the hope of understanding what happened. In the '80s, Wayne is joined by his police partner Roland (Stephen Dorff), both quietly intriguing. They were soldiers in Vietnam, clearly repressing some trauma suffered in the ‘jungle’, and have a lazy approach to police work – preferring to shoot rats than go on patrol. But when this missing-persons case comes up, they’re on it. Wayne was in the army’s Recon team and he uses his tracking skills to find out who took the kids. Their methods are unsavoury, sometimes cruel, doing things they’d probably prefer the police department not to know about. They’re a fascinating, if disconnected, team of two – walking and talking and deliberately not smiling like hard-boiled, noir detectives. The time-hops never fall into a confusing warp, and it’s easy to tell each era apart by Wayne’s receding hairline and the little transitions from tape recorder to digital camera. In 2015, Wayne is interviewed for a true-crime documentary (Pizzolatto clearly influenced by the modern fascination with true crime, especially on Netflix) based on his wife’s book, piercing back into 1990, then pushing further into 1980. We’re in his head, experiencing the confusion, and it feels like a dangerous place to linger. This 35 year period, bouncing between memories, is given unnerving gravity when Wayne says to the interviewer: ‘I never stopped coming up with theories about that case’ - it’s never escaped his mind during that time. This season could've fallen if Wayne wasn't cast properly, and Mahershala Ali proves to be an excellent choice. He might not have needed this chance to shine, considering his Oscar win in 2017 for Moonlight, but this is one of his most ambitious roles to date. All the other performances seem to orbit around him. He provides three different performances for the same character, absorbing us with each one, going from certain to confused in a blink through time travel. Yet Ali still grasps the solemn essence of that character, which latches on and stays there, no matter how old he gets. True Detective season 3 gets off to a slow but penetrating start, playing in all the classic tropes using a darker, greyer lens. The pieces have been set and a few suspects have already been pinned on our mind’s noticeboard: the distraught dad, the drunk mum, the ominous uncle, the scary teenager with a purple VW Beetle, the hated ex-soldier who collects trash… We can’t wait to remove or pursue their stories as the series continues.